It has been a good year so far for short story collections. Rebecca Makkai’s Music for Wartime, Liz Prato’s Baby’s On Fire, and Nina McConigley’s Cowboys and East Indians (just republished for wider distribution) are particular favorites. But the one that took me by surprise was Jen Grow’s My Life as a Mermaid, perhaps because I was unfamiliar with Grow before Dzanc Books sent me a copy of her book. The title and cover art piqued my interest, as did the fact that Grow had won the Dzanc Books Short Story Competition in 2012. And it turns out that honor was justified because Grow is a writer worth reading. 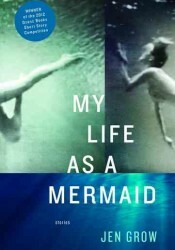 My Life as a Mermaid introduces us to a range of characters who are, like us, trying to make their way in a complex and confusing world. In a sense, the water image of the title and cover design reflect the human struggle to function in the water in which we swim. Like fish, we often aren’t even aware of the nature of our environment; it’s as invisible as the air we breathe. It also suggests the evolutionary pull that water has on humans, drawing us back to the beginning, security, and contentment. In these twelve tightly wound and tightly written tales, Grow inhabits a range of characters. The opening title story explores the relationship of two sisters, one a discontented mother and housewife and the other a relief worker in Honduras. The former envies the latter her sense of adventure, fearlessness in the face of actual and existential risk, and her ability to avoid the traps of gender roles that inhibit her potential. “Joe Blow,” one of this collection’s standouts, drops us down into the part of town we usually take pains to avoid, and provides a close-up of gentrification’s effects on a rough neighborhood, but one with a distinct character — and many distinct characters. Larry and Roger live in an abandoned pickup truck parked on the street. When Joe moves into the neighborhood, conflict ensues when he begins to renovate his house and clean up the street. The climax occurs when he calls the police to tow away the truck. “What Girls Leave Behind” is a heartbreaker of a story about a mother who has lost custody of her daughters. In a bittersweet first-person narrative, Grow reveals that the mother is lost as well and that there might well be good reason for her daughters to be with their father. But she is always recognizably human. When a man from their church comes over to interview Douglas about his experiences for a human interest piece he is writing for the church newsletter, we see clearly the contradictory nature of those effects. Douglas has lost a leg and is reeling emotionally, unable to sleep without nightmares, watching TV and drinking beer all day. But he puts on a brave face for the interviewer and says with enthusiasm that he’d go back in a second. Is he deluded? As the conversation progresses, Douglas becomes more philosophical and has some powerful words for his interviewer, and his wife. “I Get There Late” introduces us to a female agent provocateur who imposes upon a married couples she hasn’t seen in years and then proceeds to make all kinds of passive-aggressive trouble. Of course, the most intriguing aspect of the story is figuring out what motivates the protagonist. “Fixed” is another highlight of this strong collection. A young woman attends a hipster party in a warehouse loft in an attempt to cope with her grief over the loss of her boyfriend to a heroin overdose. It is a perfectly structured, poignant investigation of heartbreak, disorientation, and the yearning to belong. “Small Deaths” is a gut punch of a story about a woman caring for her dying mother. The narrator’s reaction to her mother’s death is realistically surreal, for we often respond to death in what may appear to be strange ways. “OK, Goodbye” closes My Life as a Mermaid in appropriate fashion, considering the collection’s themes. Grow has imagined several scenarios in which a woman attempts to leave her husband, but something always goes amiss — until she encounters a self-possessed young woman who inspires her to reclaim her younger self and move ahead without looking back. Grow’s stories are crisply told, trimmed of unnecessary digressions and prolix prose. The result is a series of probing and memorable character studies of people doing their best to swim rather than drown in the deep and often stormy waters of their lives. Next Guest blogger Lisa Gornick: Is my book a novel?